Matthew Messinger’s Trinity Place Holdings plans to bring 90 apartments to its Financial District condominium tower at 77 Greenwich Street, where prices will reportedly be in the range of $2,000 to $3,000 per square foot. 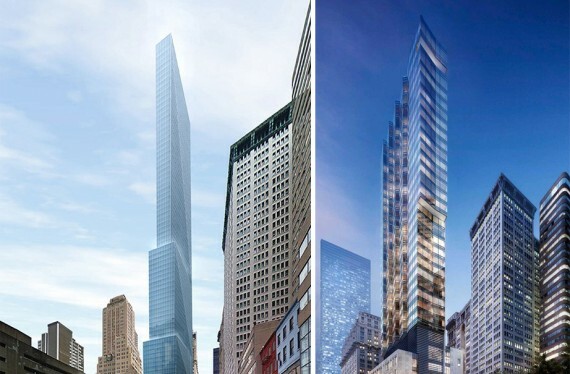 Messinger’s firm filed a permit application for the long-planned tower, also known as 42 Trinity Place, which will rise 40 stories in the air and span 280,700 square feet, according to New York YIMBY. The 40-story building, which will climb from the site of the shuttered Syms clothing store between Edgar and Rector Streets, will also include 4,800 square feet of retail on the ground floor and a 476-seat elementary school that will span roughly 56,000 square feet. The project has been years in the planning stages including a review by the Landmarks Preservation Commission regarding an architectural cantilever feature above an early 20th-century townhouse next door known as Dickey House. In March, Landmarks gave the go-head to the cantilever and the renovation of the Dickey House, which will play home to a roof deck and recreation area for the school.